Home/World News/Middle East/Iran/1st Summit of Science and Tech Development in Islamic Unity Conf. 1st Summit of Science and Tech Development in Islamic Unity Conf. Advancing activities in the area of technology and science indicates the World Forum for Proximity of the Islamic Schools of Thought in the new phase. Holding the first conference on the Muslims Countries’ Science and Technology Development should be counted as an opportunity for boosting economic cooperation and strengthening ties between countries in this realm. In point of fact, Advancing activities in the area of technology and science indicates the World Forum for Proximity of the Islamic Schools of Thought in the new phase, reported Taqrib News Agency (TNA). The meeting which was held on the sideline of the 29th edition of International Islamic Unity Conference was attended by some 40 thinkers worldwide. The first conference on the Muslims Countries’ Science and Technology Development is mounted and held for minimizing our reliance on foreigners [non-Muslim countries] and securing unity among Muslim countries. Export Development, Agriculture and Food Industry, Research and Development, branding and aerospace technology were five technical commissions mounted on the side of this conference and participants discussed to brave the standing problems in each area. The new atmosphere after the removal of sanctions may pave the way for a better banking cooperation and for the establishment of an international fund in order to support technology in Muslim world. 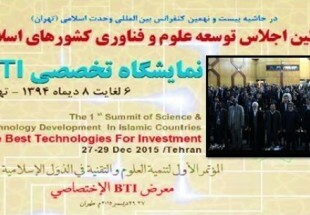 The first Conference on Muslims’ Countries Science and Technology Development was underway in Tehran from December 27-29. The Islamic Unity Week is marked between 12-17th Rabiul Awwal on the occasion of the Birth Anniversary of Prophet Mohammad (PBUH). This period in which Muslims ponder on the fundamental call of unity according to the Holy Quran was initiated by the founder of the Islamic Revolution, Imam Khomeini (RA), following the establishment of the Islamic Republic of Iran in 1979. Since its inception, the Islamic Unity Week has been marked annually, not only in Iran, but also throughout the world, and has played an important role in bringing the various Islamic Schools of Thought on a single platform, since Allah is One, and Muslims believe in the single Qur’an and bow towards the same focal point, that is the Holy Ka’ba, five times a day during daily prayers.